I featured this Bulgari beauty in a post last year. I still love it! 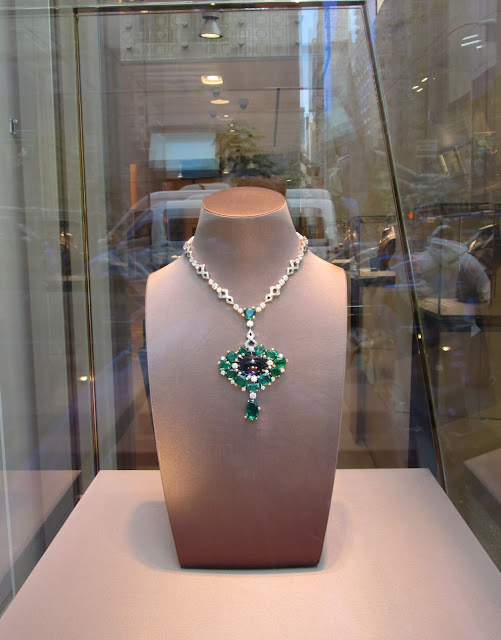 I had a chance in June to swing by the Bulgari windows on 5th Avenue in Manhattan. Like Tiffany, Cartier, and Van Cleef & Arpels, Bulgari windows never fail to delight! 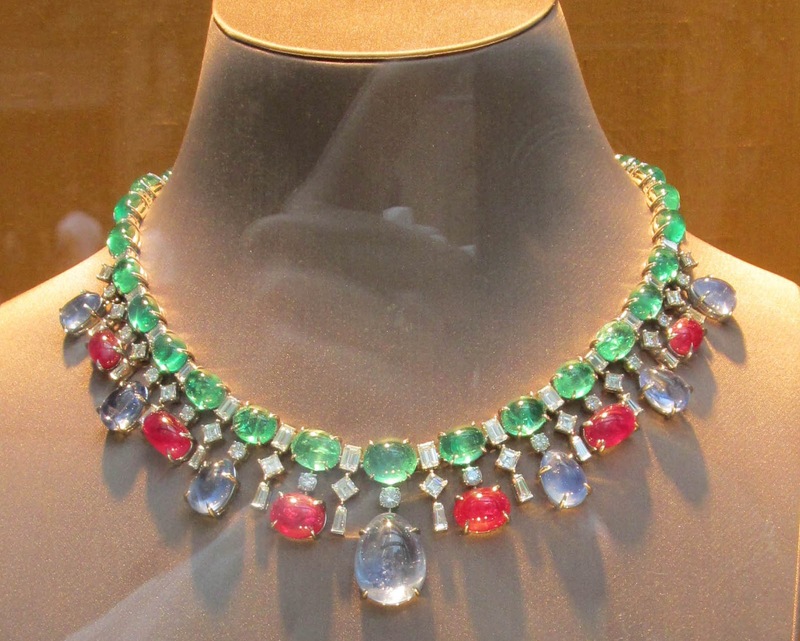 What I especially love about Bulgari is their focus on gigantic colorful gemstones. I am especially crazy for their cabochon stones! I also like their Serpenti collection, which seems so modern and glamorous. Even their pavé seems on another level—there is more of it than you ever see featured in the windows of Van Cleef & Arpels or Cartier. Their Serpenti necklace of rose gold and pavé diamonds goes on and on and just sparkles and sparkles. You can’t take your eyes off of it! 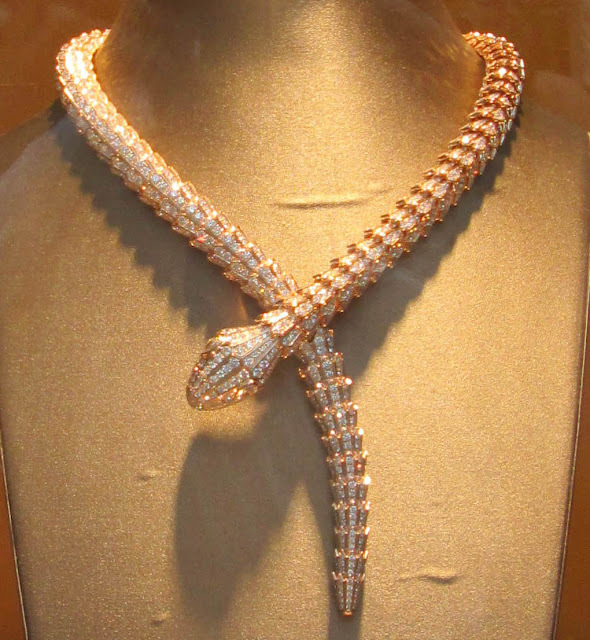 A huge Serpenti necklace in rose gold pavé in the windows of Bulgari, NYC. Wow! This necklace must weigh a ton. In looking over the pictures, and recalling what I learned at the recent Van Cleef & Arpels lecture about Elizabeth Taylor’s love of Bulgari, I can’t help thinking that these big bold beautiful pieces are a lot like Elizabeth Taylor herself. They are strong, statement-making, and unabashedly womanly, don’t you think? Just like good ol’ Liz was! I miss her. 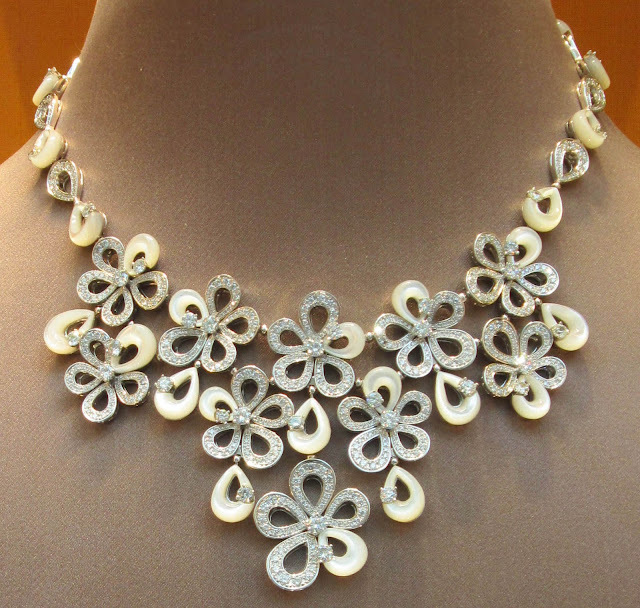 The kind of gigantic necklace Elizabeth Taylor loved! 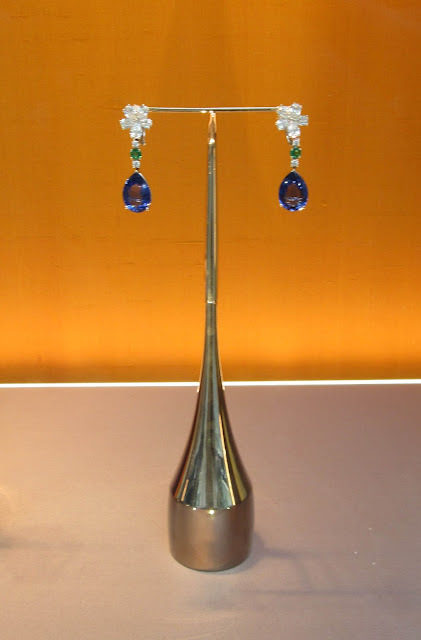 Glorious earrings in sapphire, emerald and diamond. Earrings in sapphire, diamond, and pink tourmaline (I think). I was not the only person trying to get a picture of this beautiful necklace. A detailed shot of the necklace. I weep. A necklace and earrings featuring cabochon stones. I loved all of these pieces but if I had to pick just one, to wear for one night, I’d go with either the multi-colored gemstone necklace in the first picture, the cabochon necklace above, or the Serpenti necklace below. Which ever looked best! Let me know which of them would be your ultimate—if you could choose just one of these to wear for one evening, let me know what it would be! Also let me know—do you gravitate towards feminine and bold jewelry styles à la Bulgari (on a costume jewelry level, of course! ), or tend to seek out quieter or even more masculine pieces? I would love to hear from you on this topic! A Serpenti necklace that is more my size. This I would wear, how about you? Bulgari and I wish you a glamorous week! I will have to stop by the Bulgari windows & swoon. My favorite is the diamond necklace. Is that moonstones in that necklace? 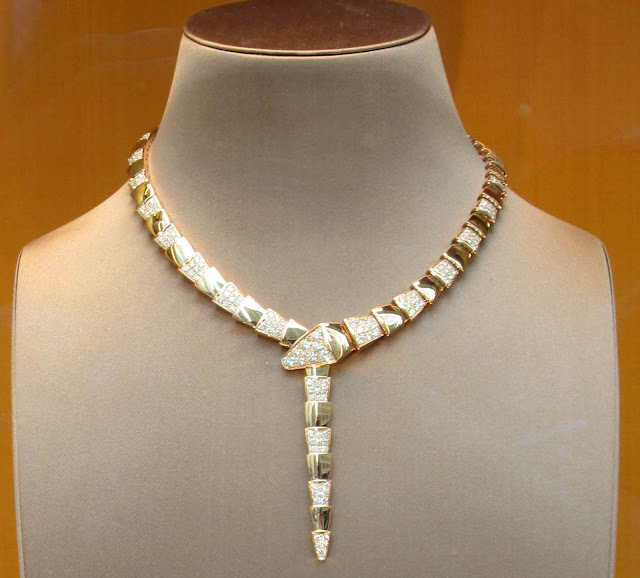 This Bulgari jewelry is so Liz Taylor. She is greatly missed. I would wear them all, Jill! But, it is only a dream...thanks for sharing the beauty...I pinned each one to my Statement Necklace board! Boy, do they make statements. 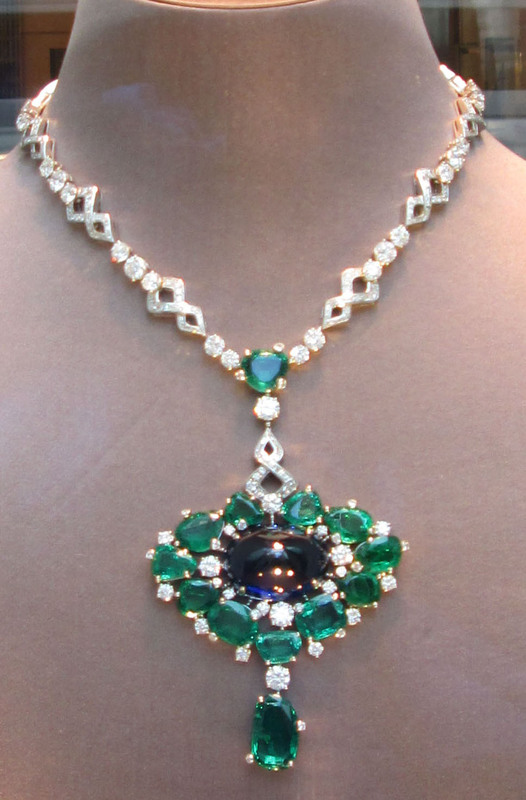 No question, the emerald Liz Taylor style necklace. They are all beautiful though!